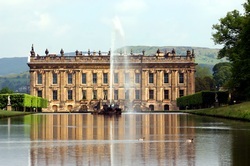 The historic 16th-Century home of the Duke and Duchess of Devonshire, set in the heart of the Peak District in Derbyshire. There is always something new to see and do in the house, garden, farmyard and adventure playground. A castellated medieval manor house that has remained mostly unchanged since the reign of Henry VIII. It reeks of antiquity and has some of the finest untouched interiors, including the Long Gallery, Great Hall and Chapel. 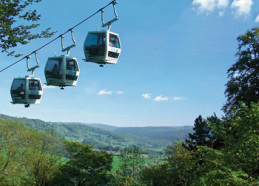 Since opening in 1780 the Heights of Abraham has remained one of the Peak District's most popular destinations. Return cable car ride to the summit, two show caverns to explore, exhibitions, picnic, and play areas, great places to eat and drink, stunning views and much more. Take a tram ride through time at Crich Tramway Village, home of The National Tramway Museum - an ideal destination for all ages. Visitors can ride world renowned vintage trams through a unique period street and out ino he open countryside for spectacular views. Ogston resevoir is great for sailing, windsurfing and trout fishing. There have been 200 species of bird life recorded at Ogston including Wilson's phalarope & Sabine's gull. There are two observation hides used by local bird watchers. Visit many picturesque villages and towns such as Bakewell, Matlock, Matlock Bath, Eyam and Wirksworth which are all steeped in their own history. Go for a leisurely walk along the River Derwent, visit the cafes, tearooms restaurants and Boutique shops.